Tonight we had family night and talked about prayer. The girls have been learning about prayer in our kid’s program at church and we wanted to keep teaching the lessons at home. When it comes time to pray before bedtime with the girls, I find it hard to think of everything that we should pray for. 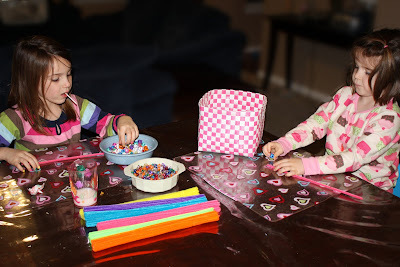 I came up with an idea that I thought the girls would love to make to enhance their prayer life. We talked about 1 Thes. 5:16 “Pray continually.” We told them they could pray for things at any time-during the day, in school, while eating, in the bath, etc. So we made prayer bracelets tonight with people’s names or things that they wanted to pray for. 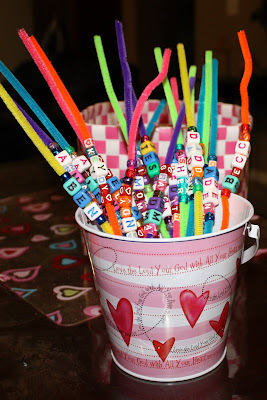 My hope is that each night the girls will pick out a prayer bracelet from their prayer bucket and then we will pray for that. Then the next day, they get to wear the bracelet all day. 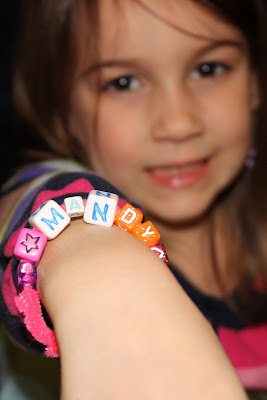 I hope that other kids will ask them about their bracelets and they will tell them. I hope that whenever they look down at their bracelet that day they pray right there, right then. 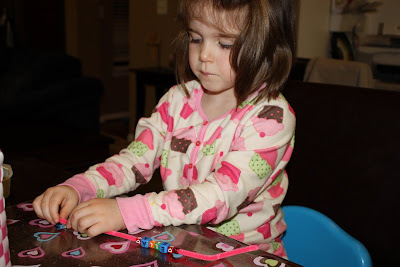 The first prayer bracelet Ella wanted to make was her own “Ella”! Rilyn loves her aunt Mandy!